Championship Manager 2010 - Pay What You Want! Championship Manager 2010 - "Pay What You Want"
The Championship Manager 2010 download offer runs until midnight on September 10th and in this period prospective players will be able to pre-register to buy Championship Manager 2010 for £2.50 (to cover the download admin) + whatever they feel like adding. From Sep 11th registered users can then download the game to their PC. Championship Manager 2010 has attracted widespread attention today with over 1000 references to 'Championship Manager 2010' returned by Google Blog Search for the 24 hour period across today. This news has also been discussed extensively on Twitter and other social sites - creating significant buzz for the new launch. 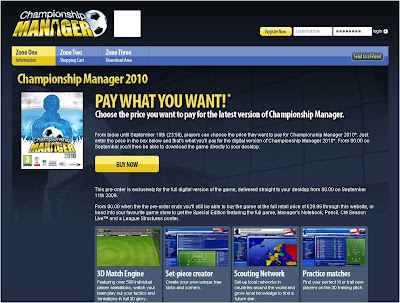 However, the Pay What You Want version of Championship Manager 2010 is a basic version of the game and does not include online functionality or extras that are available in the full version. The assumption is therefore that Pay What You Want players will be able to add additional features for supplementary cost at a later date. More and more brands are doing things to create a splash with consumers then amplifying the message as they talk about it with friends - a low cost, high profile entry offering with additional revenues delivered through physical sales or upsell of functionality at a later date. Radiohead released their 'In Rainbows' album in this way (achieving great success) and, the Chris Anderson driven, debate around 'Free' is fuelling further experiments of this nature. Will there be wider adoption of this model across the gaming sector?